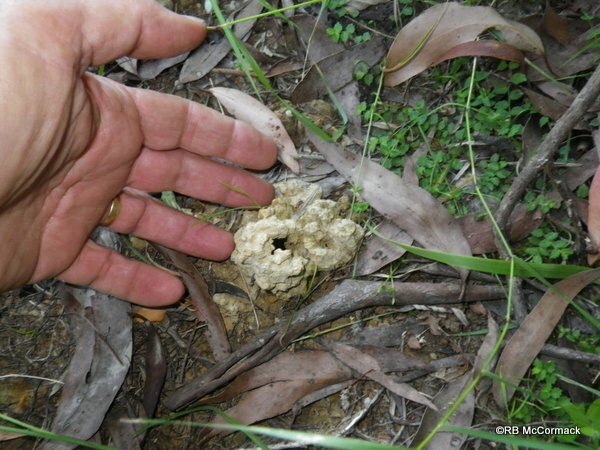 Early February 2013 saw an expedition through the Otway Ranges and the Great Otway National Park. This is a fantastic tourist destination with the park stretching from Torquay through to Princetown and up through the Otway’s hinterland towards Colac. The park has everything, featuring the rugged coastlines, sandy beaches, rock platforms, windswept heathland, tall forests, ferny gullies, magnificent waterfalls and tranquil lakes. 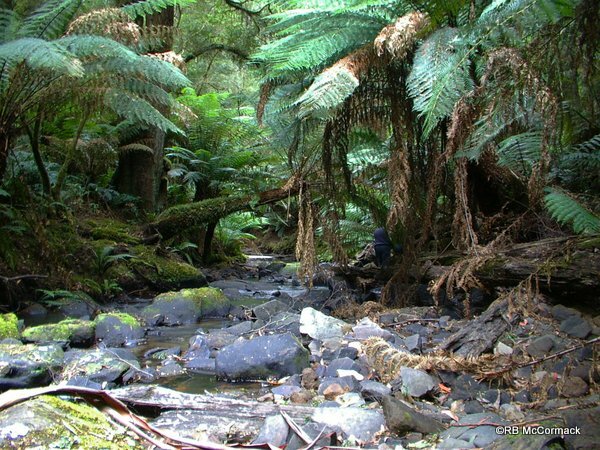 Most of our time was spent along the ranges in the lush forests under the tree ferns. 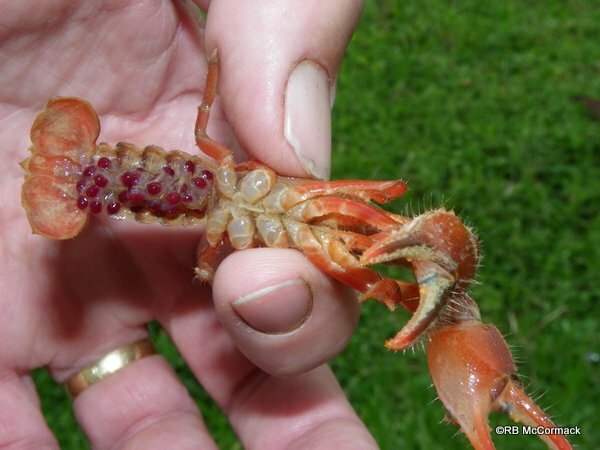 I met up with Steve Chara a well-known yabby farmer from the Torque area and we headed off together to chase a few crayfish along the Otway Ranges and into the Great Otway National Park. 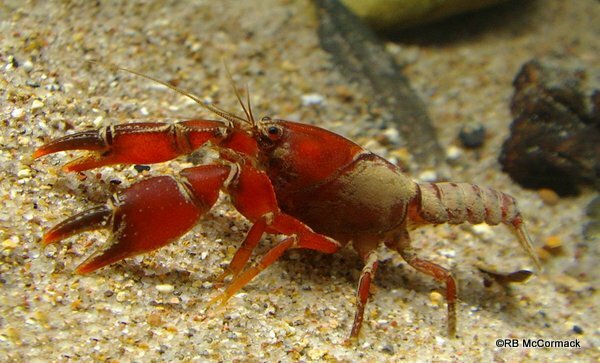 The subject of our quest was the burrowing crayfish Engaeus fultoni that is well known in the area with local residents and park rangers commenting on its bright red colouration and nocturnal habits. We had little difficulty locating this animal and it was locally abundant in all the higher wet areas we searched. Though you cannot actually see the animals you can identify their burrows by the excavated material they have pushed to the surface that is mounded into a small chimney/mound. It seemed an extremely robust species being found along the edges of watercourses and well up the mountain sides in seemingly dry areas throughout the forests. It was an interesting species with large established burrow systems being exceptionally deep. We excavated to approximately 1.4 m without determining the bottom of the burrow complex. These large “traditional” burrows would have 6-8 surface entrances with relatively vertical burrows down to chambers and then more burrows continuing down. These large burrow systems contained large numbers of juveniles and that was all we were able to extract. We expect the large adult/s were deeper beyond our reach. 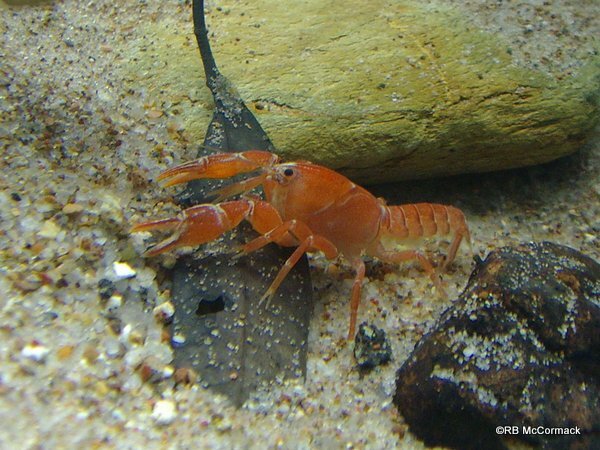 Most of our adult crayfish were captured by excavating relatively new burrow systems. These consisted of freshly excavated material with a single surface entrance and down 500-700 mm to a small water filled chamber. Invariable we would capture a single adult from these newly constructed burrows. 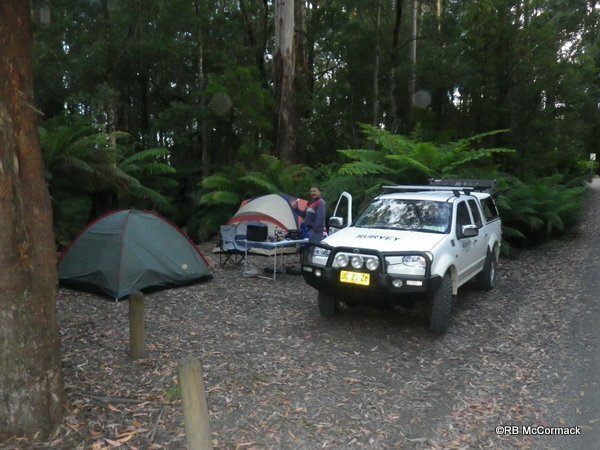 It was great survey with exceptional results but camping sites were at a premium and we ended up camping in the forest along the top of the range well away from the creeks. But even here on top of the mountain, there are Engaeus burrows only 1 m behind our vehicle.